We occasionally encounter an unusual ethical problem and enjoy puzzling over the best solution. A very familiar example is the story of a train engineer who has to decide whether to throw a switch to avoid hitting a man standing on the track, but in doing so, would kill five people on the platform. What is the right decision? Kill one person to save five? This is just one of the moral decisions philosophers have tried to answer. Jeremy Stangroom in Would You Eat Your Cat? : Key Ethical Conundrums and What They Tell You About Yourself creates modern versions of such dilemmas and helps us determine how to decide what is morally right and morally wrong. 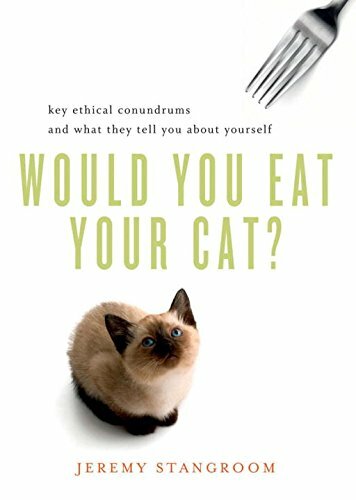 Would You Eat Your Cat? makes a terrific nonfiction book club selection or college classroom text, as it poses examples and questions about morality, with ethical dilemmas centered around four areas: Ethical Impasses, Rights and Responsibilities, Crime and Punishment, and Society and Politics. There are many ethical paradoxes that have no correct answer, yet Mr. Stangroom includes a Morality Barometer so you can gauge your response, whether you vote Pro or Con. Lest you feel overwhelmed by the world’s issues, there is an analysis of what your responses say about you. It’s quite a challenge to be given the opportunity to puzzle over societal factors of ethical and moral heft, while balancing our personal commitments and desires. Mr. Stangroom deliberates over whether it was wrong for Milo to stare at the body of Venus, even though she agreed to pose for him. You might find this an easier challenge than deciding whether you are responsible for, say, climate change. Would You Eat Your Cat? offers varied and thoughtful cases to deliberate as you examine both sides of each moral debate. Not exactly a party game, but a genuine mind-bending variety of puzzles on issues that matter to us, individually and as a species.